Follow these steps to add Cost Per Circ (CPC) titles to your collection. 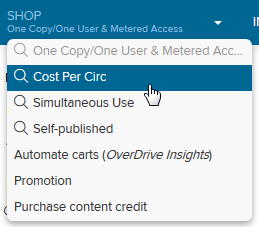 Select Cost Per Circ from the Shop drop-down menu. Browse featured titles from the CPC catalog, or use one of the search options to find CPC titles. Select Add CPC title to add a title to your collection. If you haven't set a CPC monthly budget, you'll be prompted to do so. In the pop-up, select Confirm. If you need to remove CPC titles from your collection, they can be revoked individually or all together. You can also suspend checkouts on CPC titles, so users can view and place holds on CPC titles without borrowing them.